The vultures have moved into the trees behind our house, giant evergreens with boughs thick enough to hold these heavy, ugly birds. 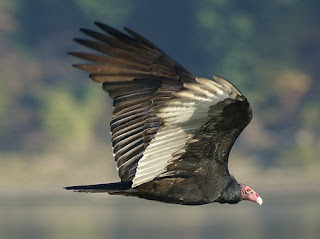 I can see them outside the bathroom window, spreading their stiff, cold wings to catch the warm eastern sunlight. And I search the sky for them as my kids and I walk to school because the vultures comfort me in a way I never thought possible. Perhaps it’s their mixture of the sacred and profane, for they remind me of awkward angels, cast-offs from heaven. The vulture’s body is repulsive with its small head, bald and red, featherless so it’s easier to shove a beak into rotting refuse. But their flight is divine — a heavy flapping of wings, the tree shuddering as it loses the extra weight, and then soaring into the clean morning air. I stop my children and silence their chatter. “Look.” And they search in front of them and finally lift their eyes upward. Some days, their response is a shrug and “oh, yeah,” but today we kept watching, and the sounds of a suburb waking up faded as we concentrated on the 20-odd vultures above us, circling higher and higher like bubbles rising in a giant blue kettle of sky. Continually reconnecting my kids to nature is one of my jobs as a parent, because it reminds them that they don’t belong at the center of the world, that hidden in front of our eyes is a parallel universe. People worry that today’s children are alienated from the natural world and suffer from “nature-deficit disorder” because as parents we’re too busy and too paranoid to let them run wild in the woods. So, what do we do? Helping children discover this sense of wonder means tearing up to-do lists and eliminating activities. It means letting go of fear so they can take their first solo flight around the block, and it means holding them close as they cry and bury the baby bird found in the back yard, a bird who will now nourish the tree that houses the vultures. I loved reading this because I can identify with these odd birds. That you notice ‘their flight is divine’ is no small thing. Therefore, I’m sure you are a wonderful teacher for your children about the ‘real’ world around them. I have a fondness for these birds. Their name in Portuguese is “urubu” and, when we lived in Brazil for a while, we learned that they are much valued as disposers of garbage. And here in the USA they tend to keep highways free of roadkill. Their soaring is magnificent and I am happy for your children that you call their attention to the beauties of nature. Beautiful post. I love how you see beauty in these often maligned birds. I agree with you. It’s important to eliminate to do lists and just enjoy the moment with our children. I loved this post. Even as an adult I can say I sometimes feel as if I have nature deficit and I think it is wonderful that you take the time to stop your kids and make sure they observe the beauty and power in the nature they live in.